Tracking is the goal of control of any object, plant, process, or vehicle. From vehicles and missiles to power plants, tracking is essential to guarantee high-quality behavior. With clarity and precision, Nonlinear Systems Tracking provides original coverage, presenting discovery and proofs of new tracking criteria and control algorithms. Thus, the book creates new directions for research in control theory, enabling fruitful new control engineering applications. Lyubomir T. Gruyitch has very rich international academic and research experience. Now retired, he was a professor at the École Nationale d'Ingénieurs, which integrated with the Institut Polytechnique de Sévenans into the University of Technology of Belfort–Montbéliard, in France; the AECI professor of control in the Department of Electrical Engineering at the University of Natal, Durban, South Africa; and a professor of automatic control in the Faculty of Mechanical Engineering at the University of Belgrade, Serbia. He has also been a visiting professor at Louisiana State University, Baton Rouge, USA; the University of Notre Dame, Indiana, USA; and the University of Santa Clara, California, USA. He continues to teach and participate at conferences on an invited basis. Dr. Gruyitch is the author of several published books and many scientific papers on dynamical systems, control systems, and time and its relativity. He has participated at many scientific conferences throughout the world. Republic of France promoted Professor Gruyitch Doctor Honoris Causa at the University of Science and Technology, Lille. He has been honored with several awards, including the highest award by the Faculty of Mechanical Engineering, University of Belgrade, for teaching and scientific contributions to the faculty, 1964–1992; and an award from the Yugoslav Air Force Academy for teaching achievements in the undergraduate course foundations of automatic control. Dr. Gruyitch earned his Certified Mechanical Engineer (Dipl. M. Eng. ), Master of Electrical Engineering Sciences (M. E. E. Sc. ), and Doctor of Engineering Sciences (D.Sc.) degrees from the University of Belgrade. "Numerous publications and books present various aspects of tracking, but I do not know of another book only devoted to tracking and its various aspects. ... I used to teach tracking in my courses of process control and stability analysis of complex nonlinear systems, and this book could be very interesting to improve my courses. ... 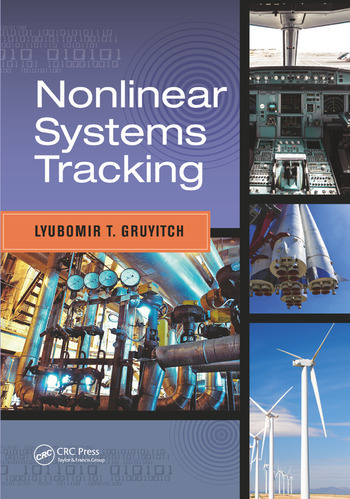 This book gives a complete presentation of the various aspects of tracking of nonlinear and/or time varying systems, including the determination of the maximum error for ill-defined and/or perturbed systems."